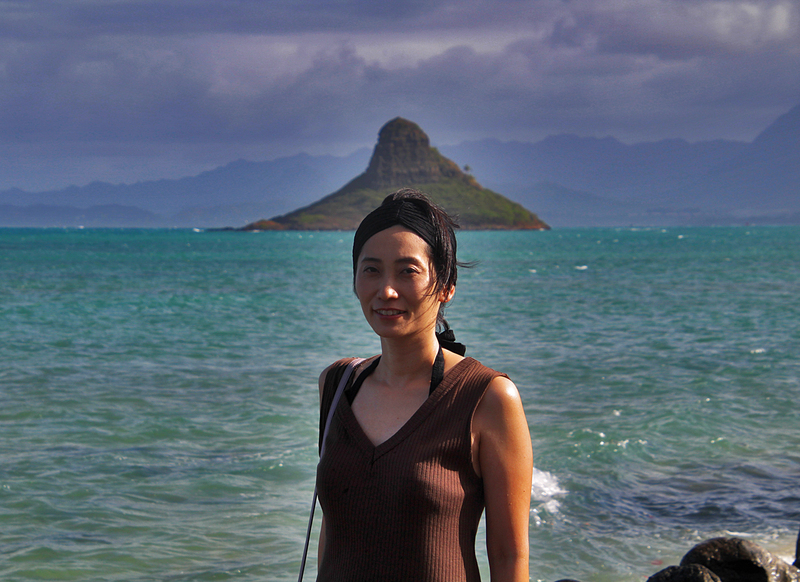 My tour posed with Chinaman’s Hat. 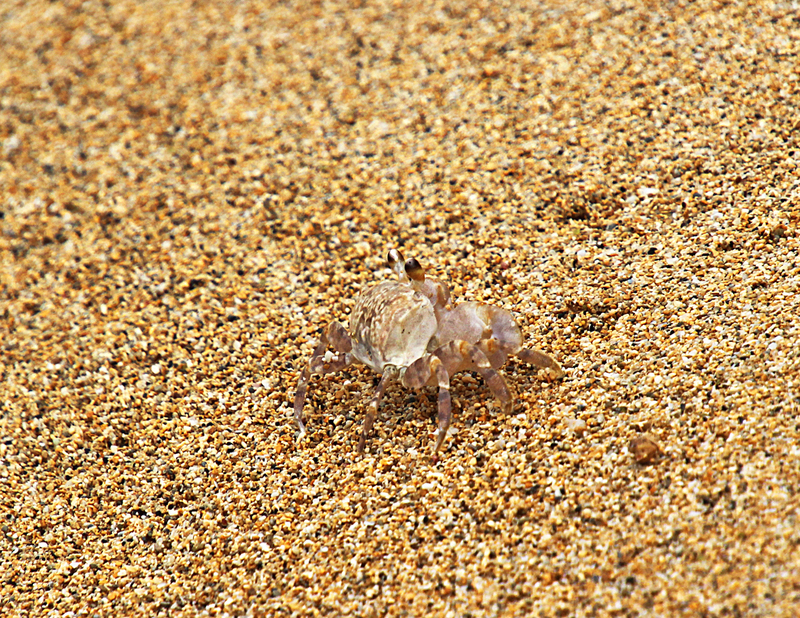 A well camouflaged crab in Hau’ula. 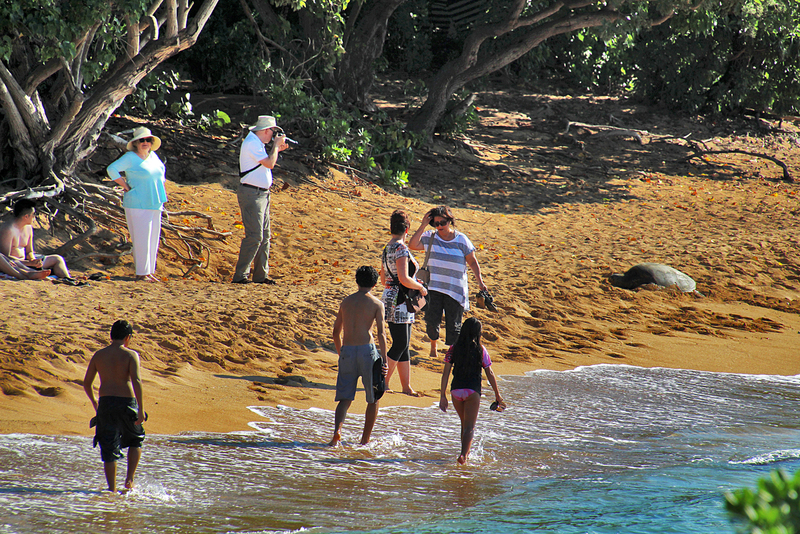 A monk seal on the beach in Hau’ula. 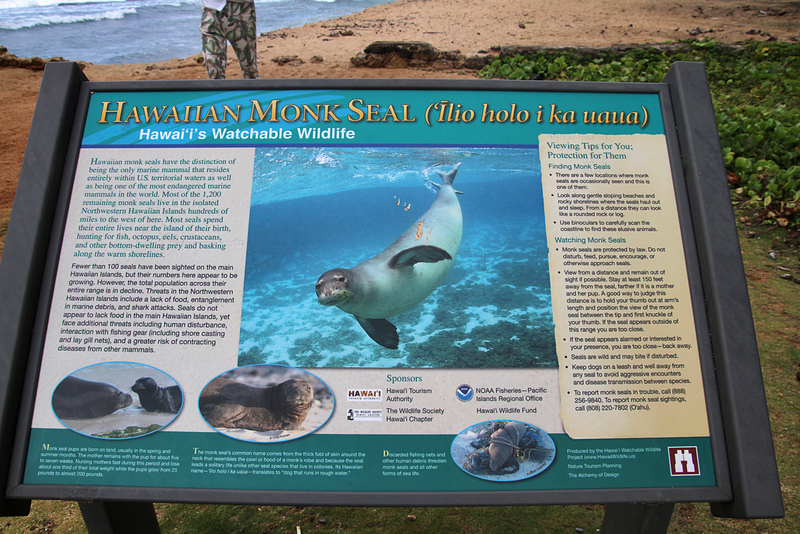 This beach is such a frequent resting spot for the Hawaiian Monk Seals that they’ve installed this information panel. 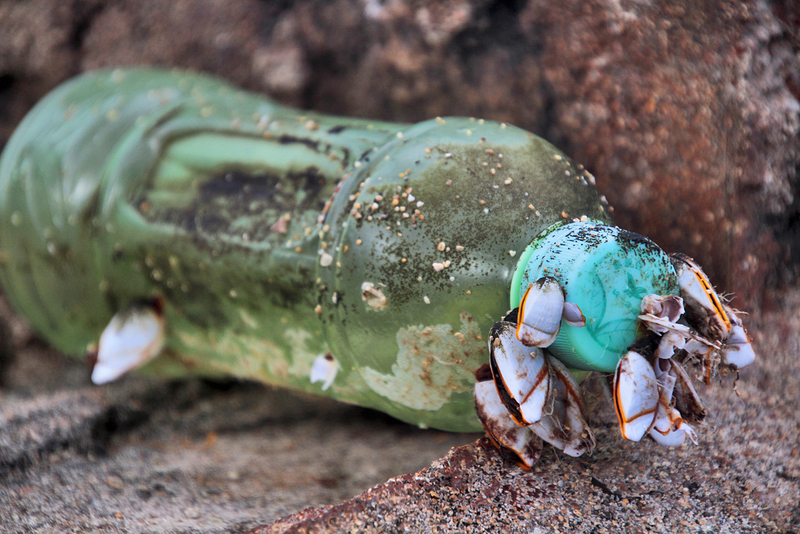 This side of the island gets a lot of debris washed up onto shore because of the trade-winds. 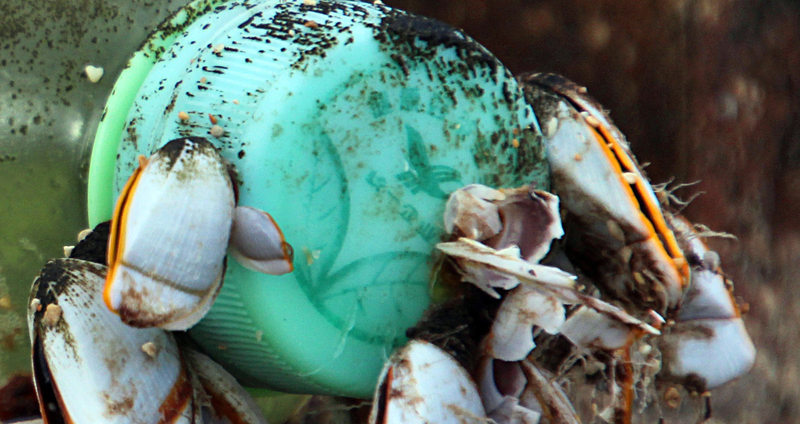 We’ve gotten some interesting stuff wash up since the tsunami in Japan. The Japanese woman on my tour, judging by the writing on this botttle suggests that this came from Taiwan. This kid at Rocky Point got barrelled on this wave and made it out clean. 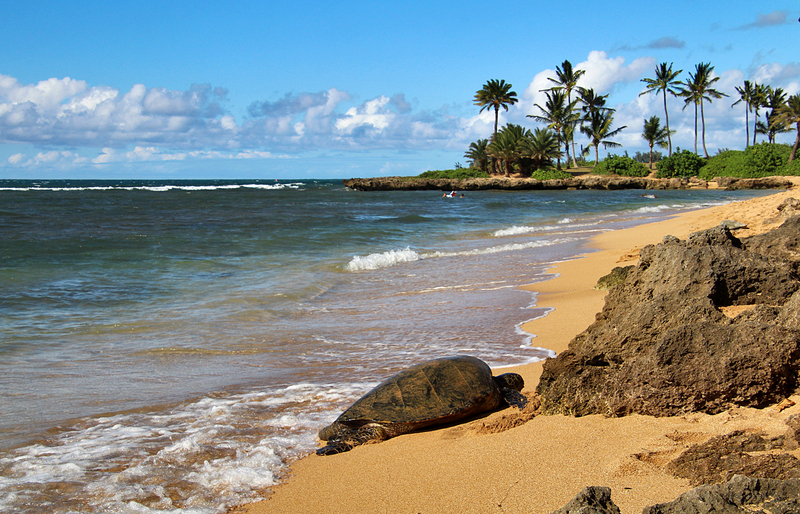 A turtle on the beach on the North Shore. 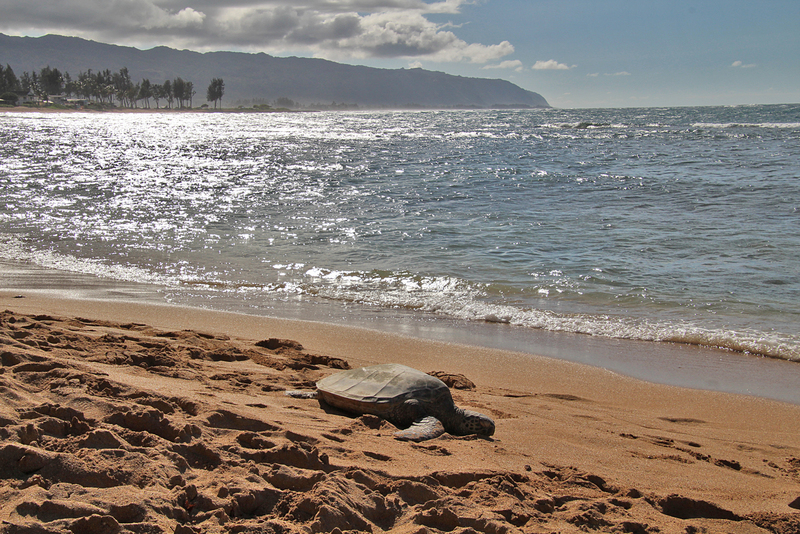 My tour spotted another turtle in the water. 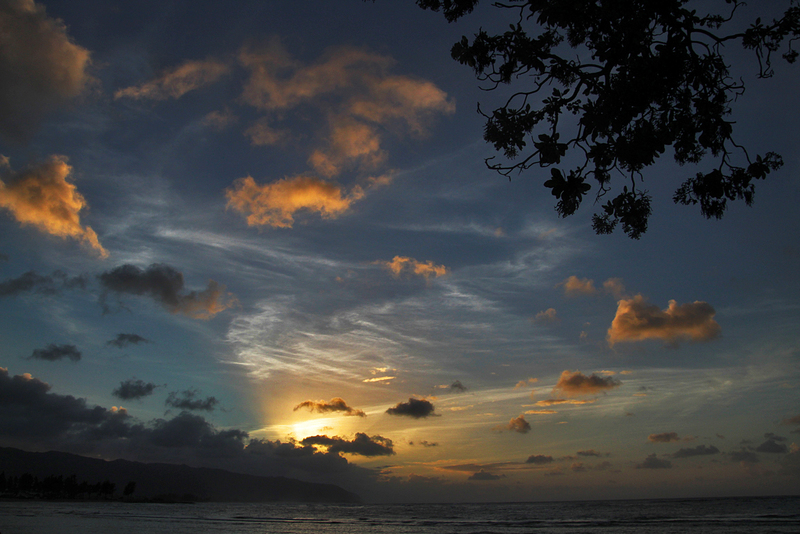 Sunset from the North Shore. My tour planned their vacation to be in Hawaii when there was no Moon, so they could see the stars. 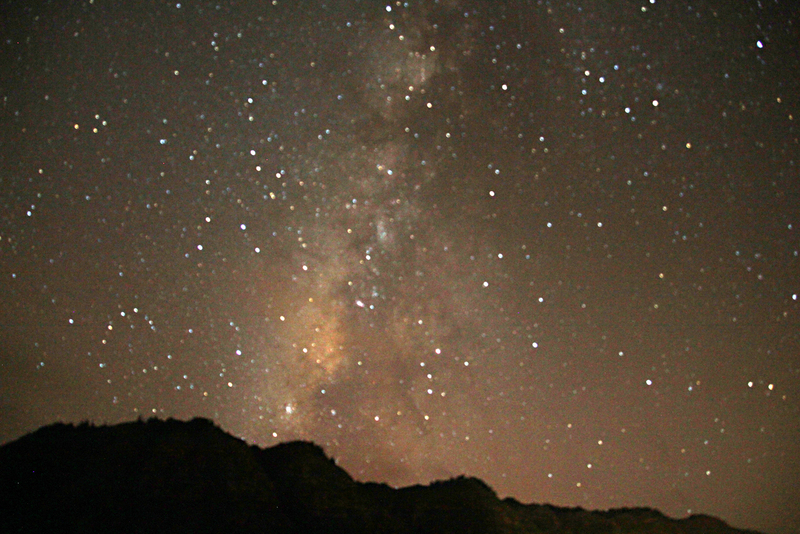 This is the Milky Way from the North Shore. 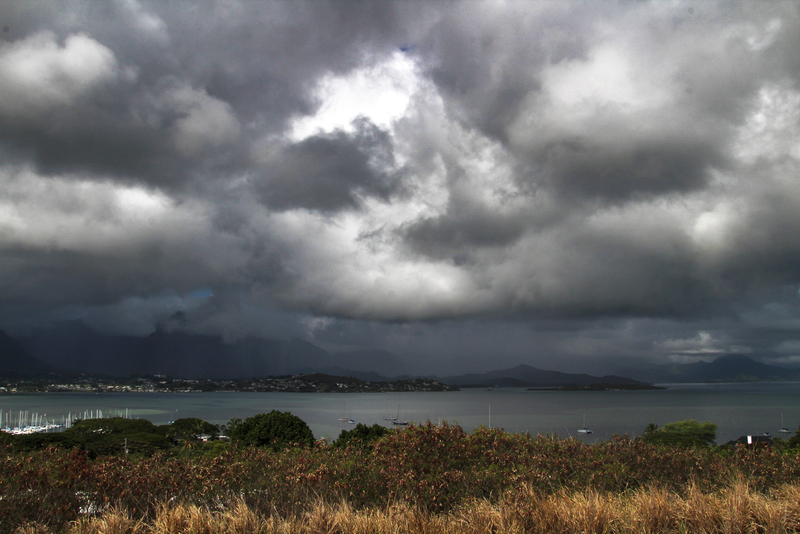 Kaneohe Bay. Gillagan’s Island is on the right. The Crouching Lion. 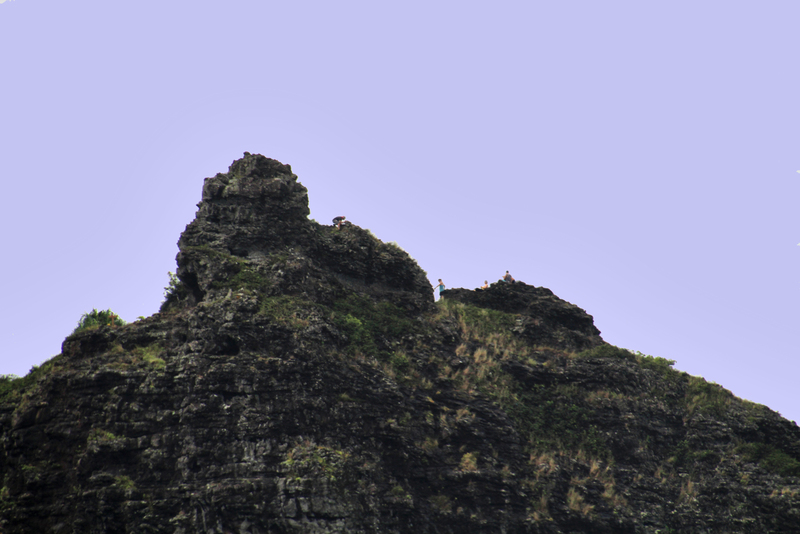 It’s become a popular hike recently with views of Kahana Bay. My tour getting a shot of a surfer at Rocky Point. Albizia saman is a species of flowering tree in the pea family, Fabaceae, that is native to the Neotropics. 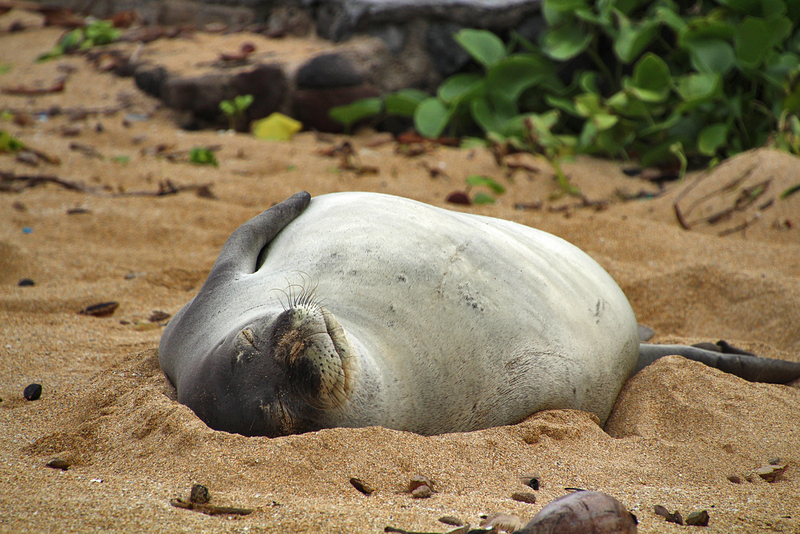 Its range extends from Mexico south to Peru and Brazil, but it has been widely introduced to South and Southeast Asia, as well as the Pacific Islands, including Hawaii. 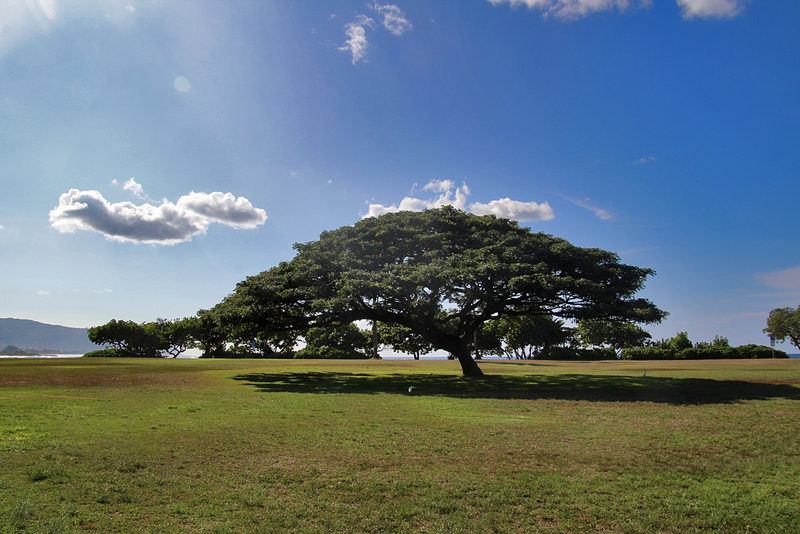 Common names include saman, rain tree and monkeypod. 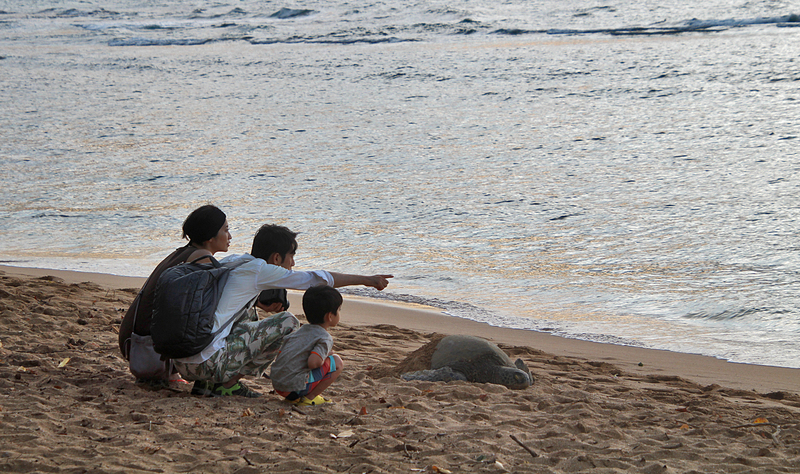 My tour getting a shot of a turtle on the beach. 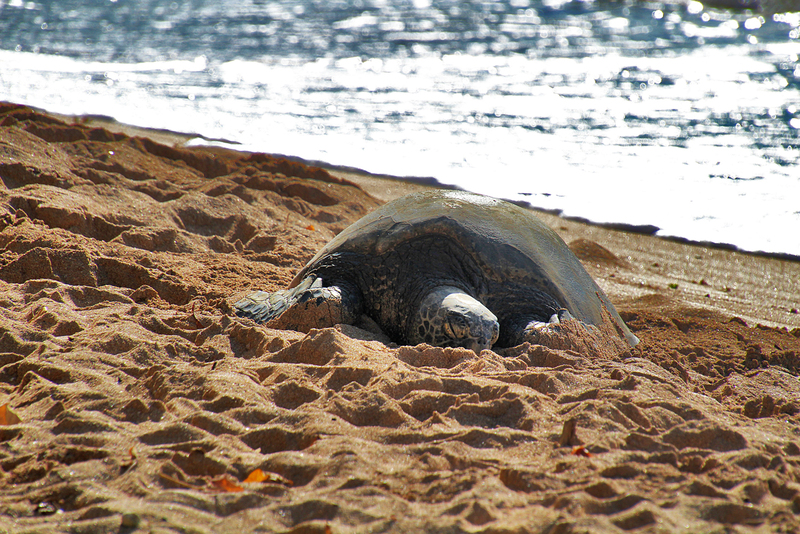 My shot of the turtle on the beach. 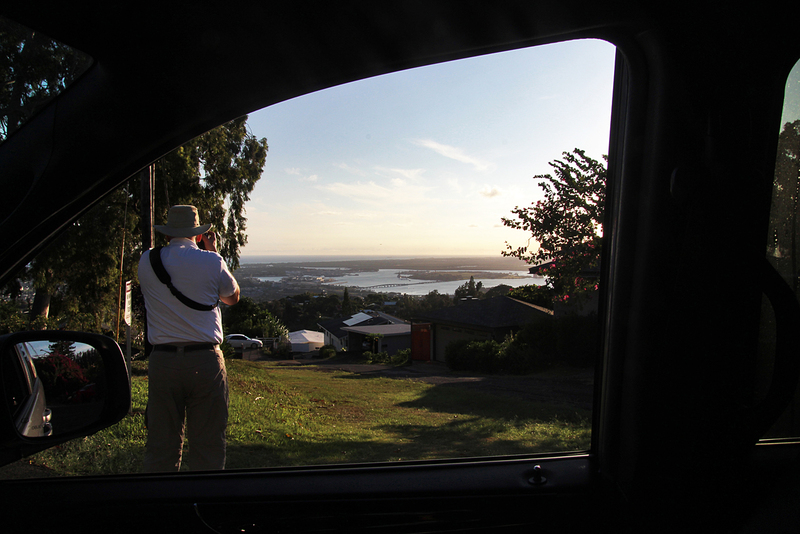 My tour getting a shot of Pearl Harbor. 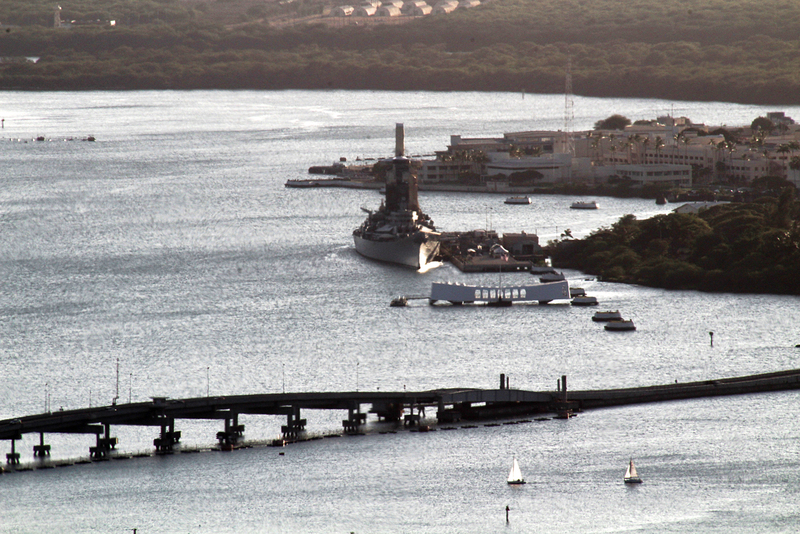 My shot of the Arizona Memorial and USS Missouri taken out the passenger window from the driver’s seat. 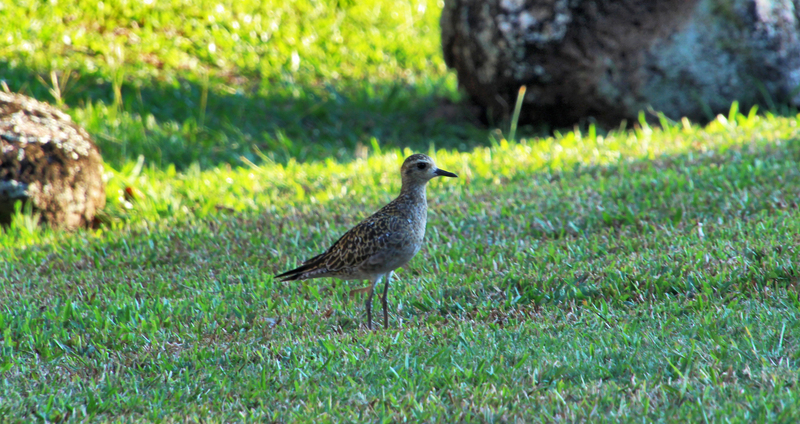 A Pacific Golden Plover seen at a heiau above Aiea. The Pacific golden plover (Pluvialis fulva) is a medium-sized plover. The genus name is Latin and means relating to rain, from pluvia, “rain”. It was believed that golden plovers flocked when rain was imminent. The species name fulva is Latin and refers to a tawny colour. 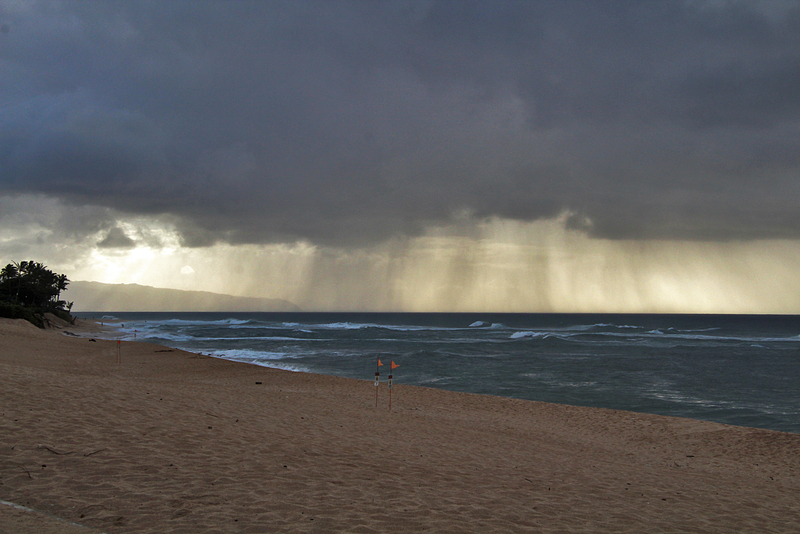 We just had a big rain storm in Honolulu tonight and I can hear the call of the plovers, tu-tuuuit! It is migratory and winters in south Asia and Australasia. 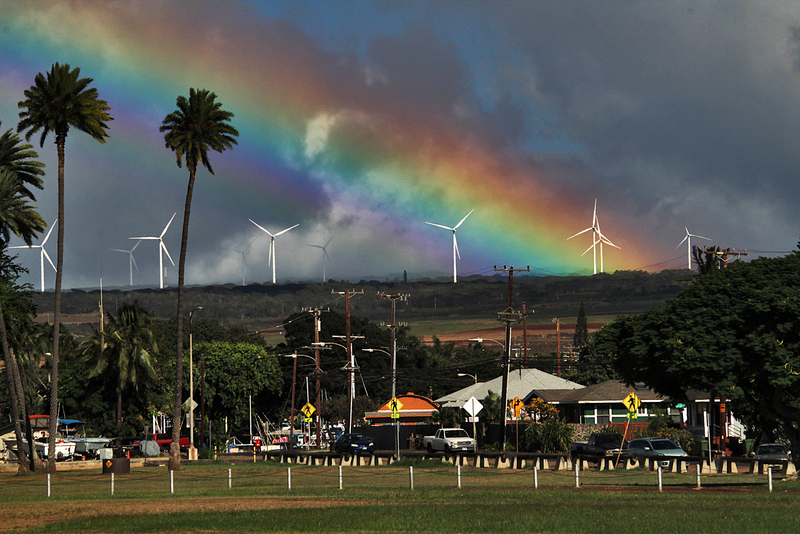 A few winter in California and Hawaii, USA. 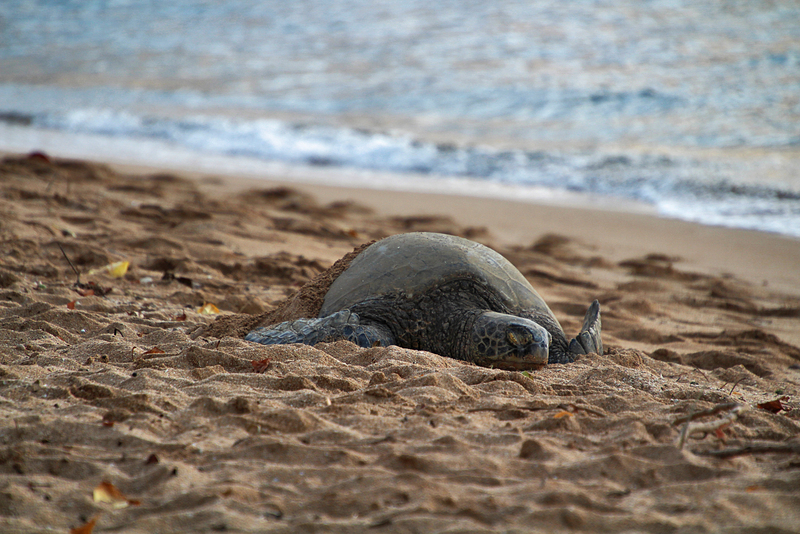 In Hawaii, the bird is known as the kōlea. It is very rare vagrant to western Europe. 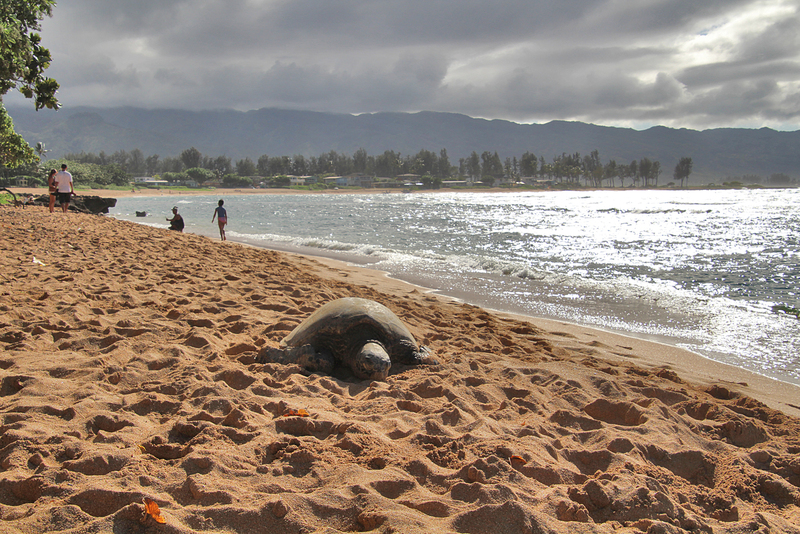 They return to the same wintering territory each year, which allowed scientists in Hawaii to attach tiny light level geolocator devices to the birds and then retrieve them the following year in the same location. This research revealed that these birds make the 4800 km non-stop flight between Alaska and Hawaii in 3–4 days. Alaskan breeders winter in Hawaii, Fiji, South Pacific Islands, all the way to New Zealand. Hawaiians may have found their islands by following the spring migration of the golden plover from Tahiti to the Hawaiian chain, as the birds returned to the North American mainland. The plover’s migration route strongly suggested the presence of land to the north, prompting the Polynesian explorers to sail in that direction and eventually discover the Hawaiian Islands. As critical as celestial navigation was to their success, it is important to note that the correct compass heading required to reach the Hawaiian Islands from Tahiti could only have been confirmed following successful landfall by the first mariners. Apparently, long-distance flights of the Pacific Golden Plover also served as inspiration to early British explorers. In 1773, Captain James Cook sailed the waters of Tahiti during his second expedition. 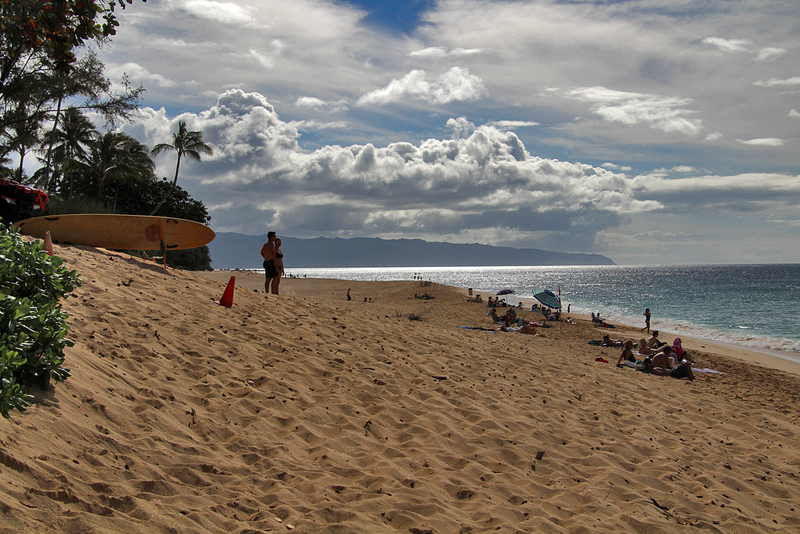 Sunset Beach, calm here on October 11th, is forecast to be 12-18 feet Hawaiian on October 27th; that’s 18-30 foot faces. The Winter season is nearing and the surf competitions will be starting soon. 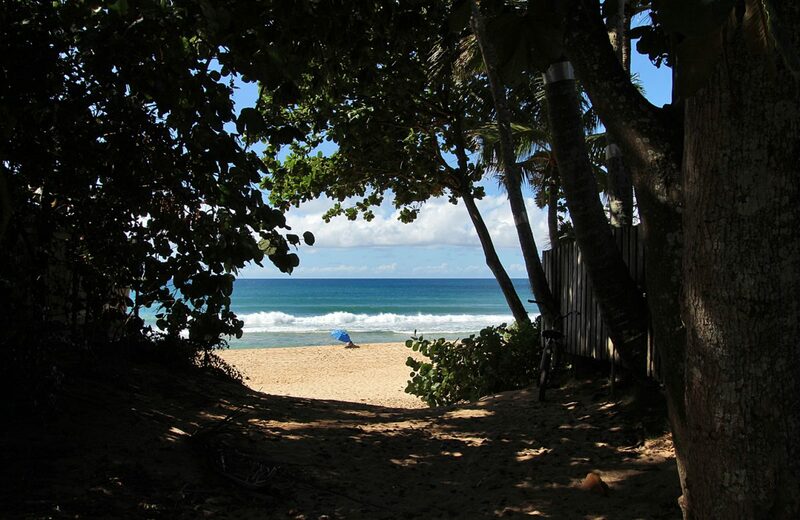 The HIC Pro at Sunset Beach starts October 27th. Then the Vans Triple Crown of Surfing starts November 12th at Ali’i Beach Park in Hale’iwa with the Reef Hawaiian Pro, followed by the Vans World Cup of Surfing at Sunset Beach starting November 25th, and wrapping up the Triple Crown is the Billabong Pipe Masters at Pipeline of course, starting December 8th. 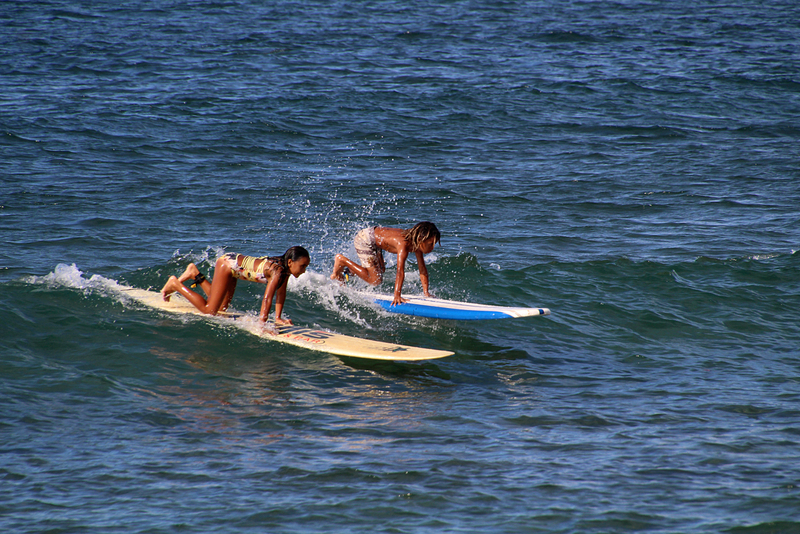 The holding period for the Quicksilver In Memory of Eddie Aikau is from December 1st to February 28th. 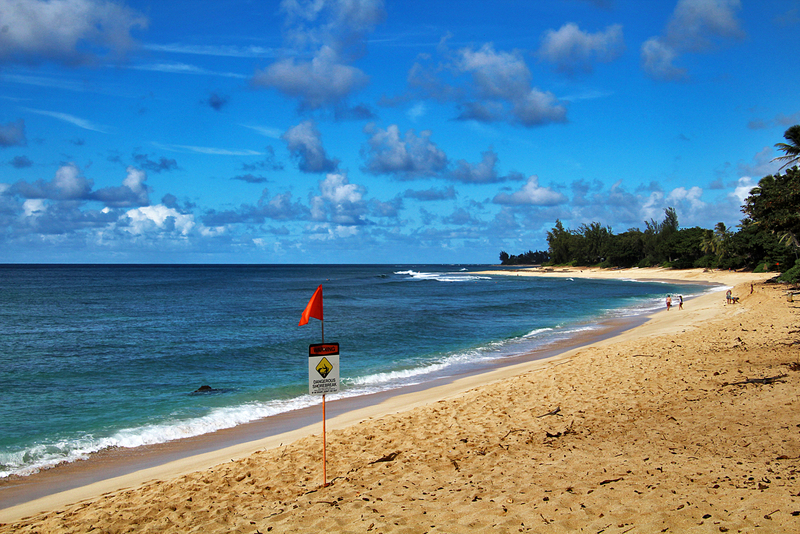 Ehukai Beach Park, looking toward the Banzai Pipeline, home to the 3rd and final jewel of the Triple Crown of Surfing. 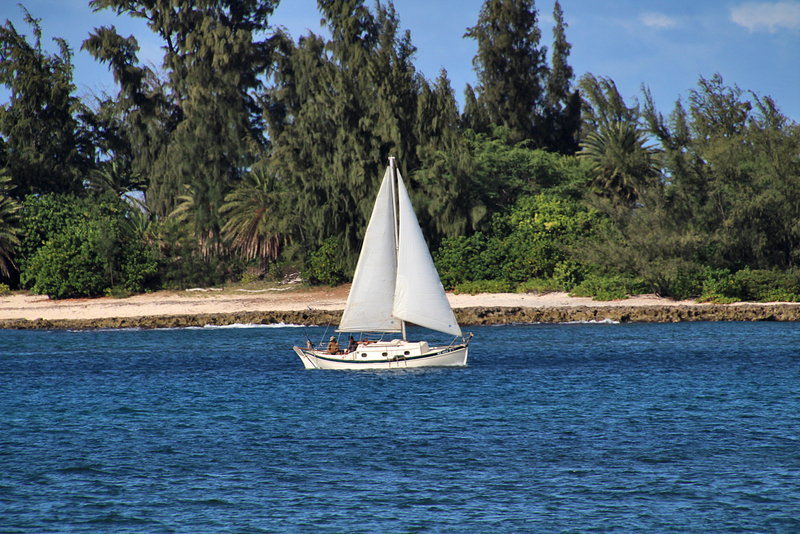 A sailboat in the bay at Hale’iwa, taken from the beach at Ali’i Beach Park, the site of the first jewel of the Triple Crown of Surfing. I wonder if they signed up for the 3 hour tour. 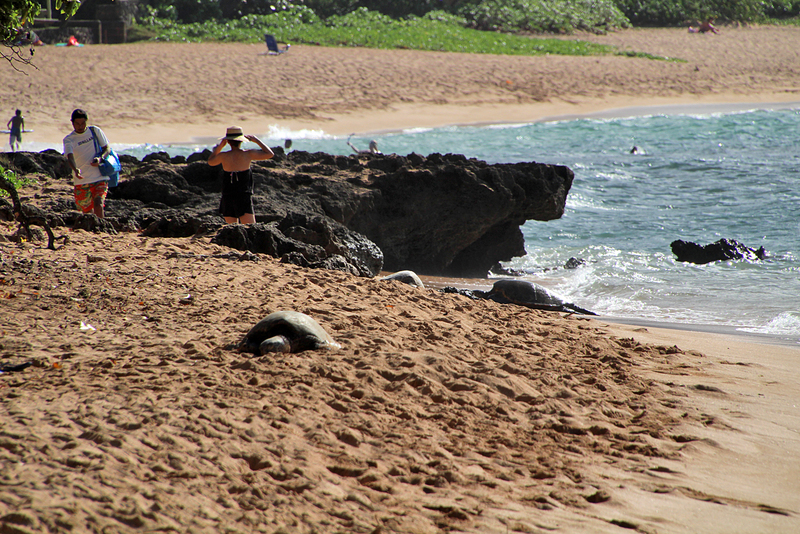 Here are a couple of potential world champs at Ali’i Beach Park. Many pro surfers have cut their teeth here at Hale’iwa, from Sunny Garcia and Johnny Boy Gomes, to current world champion Jon Jon Flores whose home break this was, living practically across the street growing up. 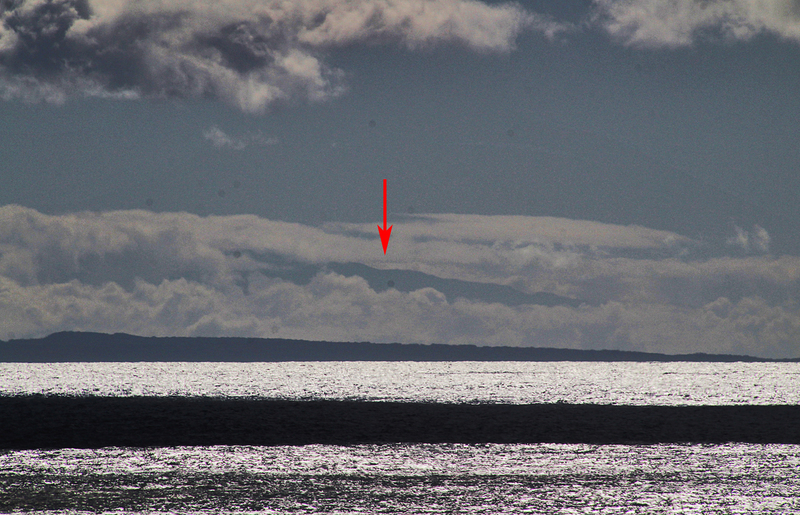 On a clear day you can see Maui. 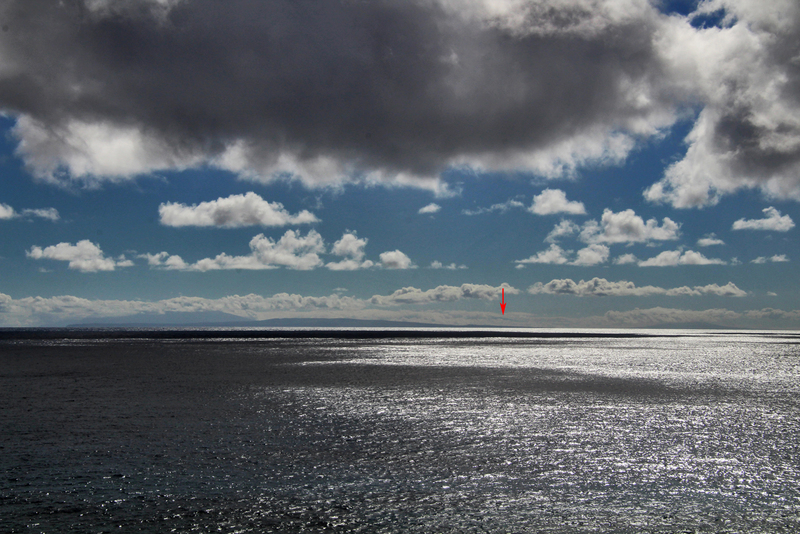 I’ve overheard several tour guides tell folks that the higher mountain to the far left, is West Maui. That is incorrect. The high part on the left is East Molokai at almost 5,000 feet, the lower part in the foreground is West Molokai at just under 1,400 feet, and below the red arrow on the right is Mount Haleakala on Maui at just over 10,000 feet. I made this to send to DLNR when I found that they had made the same mistake, incorrectly labeling East Molokai as West Maui, on a panel board on the Makapu’u Lighthouse Trail. 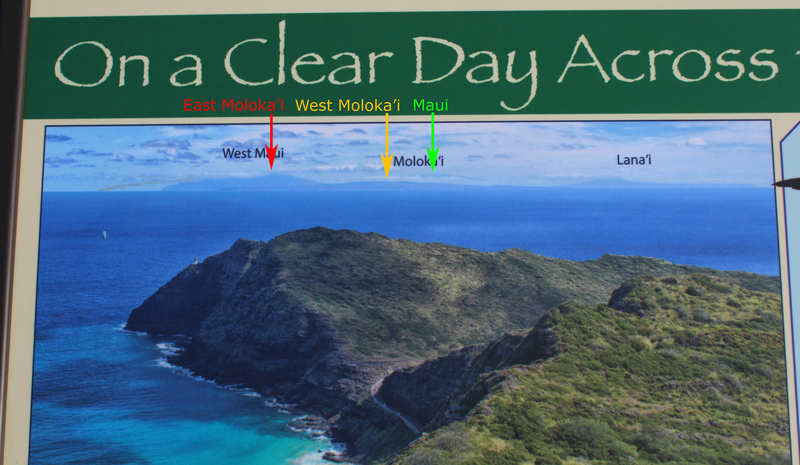 The white arrow shows where West Maui would need to be for their display (below) to be correct. The incorrectly labeled panel board on the Makapu’u Lighthouse Trail, here with my corrections in Photoshop. 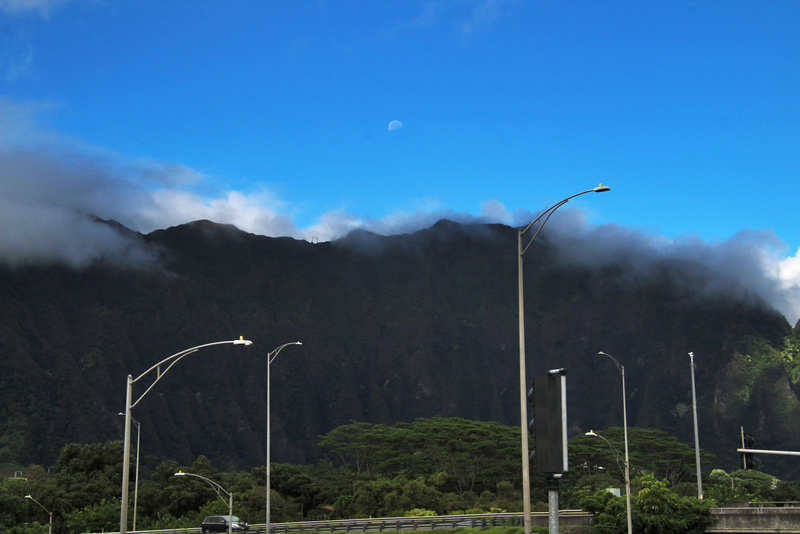 I spotted the Moon over the Ko’olau mountains while stopped at a traffic light in Kaneohe. A rainbow seen from Ali’i Beach Park toward the end of our tour.